This Re-Order Point Calculator gives you a quick and easy way to review and check the re-order point (or MIN) for your inventory items. We suggest that you use this calculator on a routine (daily) basis before placing new purchase orders. However, it is also a useful tool when conducting a structured inventory review. This re-order point calculator uses an approximation to a normal distribution based on your estimates of criticality and volatility. Criticality is based on a three level scale related to service level or fill rate. Volatility also uses a three level scale. The instructions are shown on the calculator. 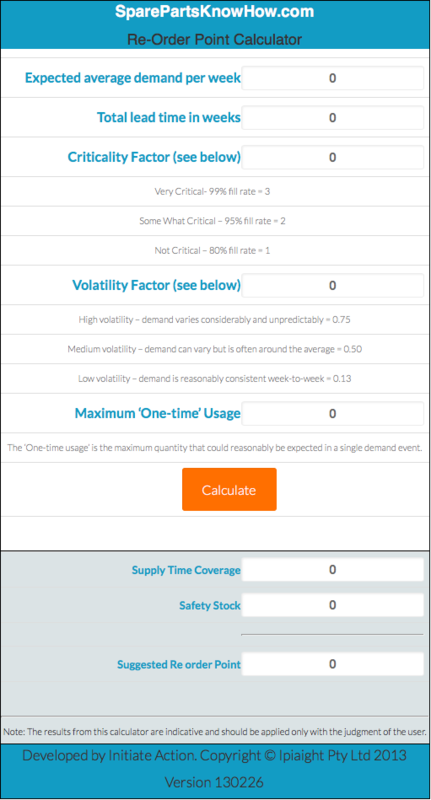 The calculator uses an proprietary algorithm to determine both your Cycle Stock (Supply Time Coverage) and Safety Stock and then sums these values to determine your suggested ROP. It is our suggestion that you try different values for the criticality and volatility factors as this will test your assumptions and help you see the range of potential outcomes from those assumptions. Importantly, this calculator is designed to avoid the ‘Trap of Averages’ – the fact that occasionally you might need a fixed quantity that is greater than the average. This is termed as the ‘Maximum One-time Usage’. An example of this could be filters for a series of pumps. Let’s say that you have a bank of 6 pumps and sometimes you need to replace all six filters but usually you don’t. This calculator takes this into account to help ensure that you don’t get left short. Access is exclusively part of the Full Access and Support Package.